Seminole Ridge’s Lynzie Smickle battles for a shot. 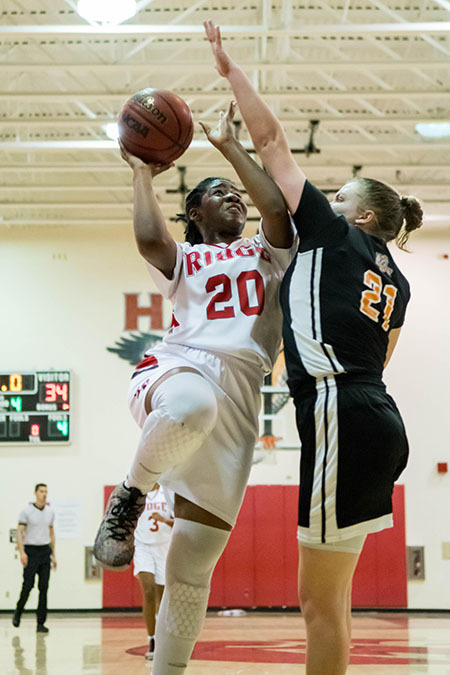 The Seminole Ridge High School girls basketball team hosted John I. Leonard High School on Thursday, Jan. 24, coming away with an impressive 50-34 victory. The win marked the second victory against the Lancers this season and improved the Hawks’ win streak to 10. Seminole Ridge (18-2) found themselves down 2-0 in the early minutes of the game, but the Lancers’ lead was brief. The Hawks responded with 14 unanswered points to close the first period 14-3. The Lancers struggled to finish at the rim against a quick and physical Seminole Ridge defense and were held to single digits nearly the whole first half. A pair of three-point baskets from Aspen Johnson and India Shepard added difficulty for the Lancers to close the margin. John I. Leonard rallied in the final two minutes of the first half to close the gap to 24-16, getting them within eight points. Ashley Thornton opened up the second half for the Hawks with a three-point basket that sent a clear message to the Lancer defense they were in for a battle. The Lancers were able to win rebounds and pass the ball well, but the team continued to grapple with success at the rim. The Hawks opened it up on offense through the second half, scoring 26 points to the Lancers’ 19, and extended their advantage to 44-24 by the end of the third period. John I. Leonard pursued the fight, outscoring the Hawks 11-6 in the final period, but the Hawk lead was too great with the time remaining. Seminole Ridge secured a 10th-straight win 50-34 and improved to 18-2 on the season. The Lancers fall to 15-10. Top performers for the Hawks were Thornton with 14 points and a three-point basket, while Johnson tallied 12 points and a three-point basket. Aneeshea Cason and Lynzie Smikle combined for 15 points.